Died: 25th May 1917; age 29; Died of Wounds – Langensalza Prisoner of War Camp- in hospital. Enlistment Location: Bury St. Edmunds, Suffolk. Date of Entry Therein: 5th August 1914. Rank: Sergeant; Service Number: 202382; Regiment: Suffolk Regiment, 4th Battalion. Relatives Notified & Address: Son of the late James Capon, of Ipswich. Arthur was 3 years old and living with his mother & siblings. They were living at the home of their widowed, maternal grandmother. Mary Ann Godbold, 64, a Monthly Nurse, born Stowmarket, Suffolk. Emma Jane Capon (nee Godbold), 35, born Stowmarket. James Edgar C. Godbold, 8, born Ipswich. Arthur Robert Capon, 3, born Ipswich. Emma Jane Capon, 1, born Ipswich. 1901 St. John’s Home for Boys & Girls, Bloomfield Street, Ipswich. Arthur was 13 years old, an Inmate at the Workhouse School. His siblings were also Inmate’s at the workhouse. Bertie Capon, 9, born Ipswich. Kate E. Capon, 5, born Ipswich. 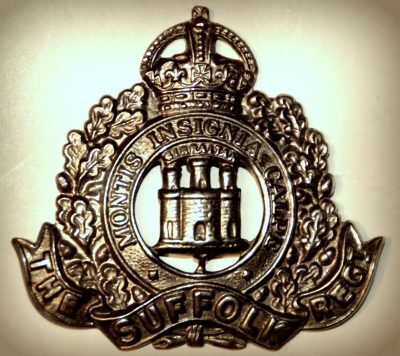 Arthur was 23 years old, a Soldier ranked Private for the 1st Battalion of the Suffolk Regiment. Occupation – Armourer’s Shop. A separate home for pauper children was first proposed by Ipswich Union in around 1870. This was an unusual step for non-metropolitan unions at this time, and may have been the result of space shortage at the Great Whip Street workhouse. Plans were produced in 1871 and 1873 for a long building with a central block flanked by separate wings containing boys’ and girls’ accommodation. The building, eventually erected at Bloomfield Street in 1879, accommodated 80 boys and 50 girls. The boys were taught to work on the land, and in tailoring and shoe-making. The girls were taught needlework and other household skills to equip them for domestic service. A small infirmary was later added. Arthur’s sister, Kate, was 10 years old, when on the 2nd August 1906, from the Port of Liverpool, she was sent to Quebec, Canada. Travelling on board the S.S. ‘Dominion’ of the Dominion Line. Kate arrived on the 11th August 1906. Arthur’s brother Bertie was 12 years old when on the 12th March 1908, he travelled with the Dr. Barnardo’s Homes, London, from the Port of Liverpool, on board the S.S. ‘Dominion’ to Toronto, Canada. Arthur’s effect’s were sent first to his paternal uncle Walter Capon, and later to his widowed aunt Mrs Elizabeth Capon. The Prisoner of War Camp at Langensalz was opened in 1914, and held 10,000 men. Many of the prisoners were sent to work at the local salt mines. The war camp was described as the most sinister camp in Germany. With the guards described as being the most brutal and ferocious. The men were huddled together on a large sized ploughed field so situated that it caught all the water draining from the surrounding hills. Sanitary arrangements on a par with those of the native quarter in an Egyptian town. Food of the vilest and unhealthiest nature for human consumption. Long ramshackle dilapidated barracks to hold 7-800 men with no thought in their construction for comfort and accommodation.